Imagine how your life would change if you discovered the secrets to understanding the Natural Laws of Creation? What if you could access the wisdom of the ancients directly and were able to live your life as a spiritually awakened being, with an open heart, creating the life that you dream of? 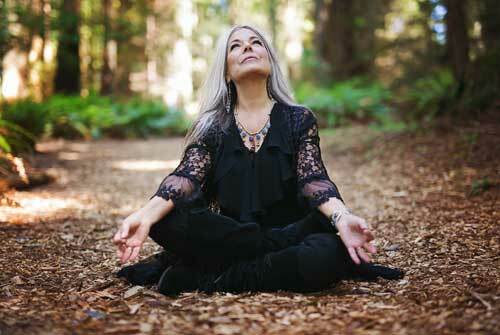 Wind Hughes is a modern-day feminine shaman. In this book, she takes you on a journey out of the confines of the body, to the expanded reaches of spiritual experience beyond life, as we know it. Life Is the Ceremony chronicles her visions, mystical experiences, meeting with teachers from other dimensions, and her use of ceremony to call in her soul mate. By sharing her personal journey through the mystical and quantum realms and integrating them into her personal and professional life, Wind makes the transcendent life accessible to everyone. This book is a practical how-to guide for living your own unique conscious and awakened life, and becoming the powerful manifestor that you are. It is a map leading to the doorway opening to the other side. Awakening and becoming a Spiritual R-Evolutionary is the most powerful personal and political act. Individually, we can change the planet. You may laugh, you may cry: you will come away transformed. Making the transition into womanhood is a time of great potential, challenge, discovery, courage and confusion. Girls often face the journey alone, risking their sense of self and purpose along the way. Daughters of the Moon, Sisters of the Sun provides validation, support and vision through powerful and compelling autobiographical stories gathered from more than forty teenage girls, over half of whom participated weekly in a two-year focus group. By sharing themselves intimately on topics ranging from bulimia, anorexia, body image, peer pressure and terminal illness, to empowered relationships with males, lesbianism, pregnancy, motherhood, drug exploration, sexuality, abuse and suicide, these young women explore the process of discovery, healing and developing self-esteem. Candid narratives are accompanied by interviews with accomplished women mentors. In Daughters of the Moon, Sisters of the Sun, women and girls will recognize themselves and each other and the ageless and timeless struggle of all young women to evolve to be who and what they are. Few books on the development of adolescent girls are compelling enough to actually be read by the girls themselves. 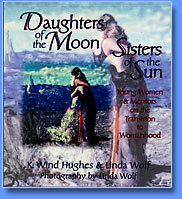 Daughters of the Moon, Sisters of the Sun is the exception, with young women the primary audience. Professors and students of Women's Studies courses, educators, professional counselors and parents will also find here a wellspring of insight and understanding. Photographs by world-renowned photographer, Linda Wolf, elevate this book to one of absorbing beauty. Wind Hughes and Linda Wolf are co-founders and co-directors of the Daughters/Sisters Project based on Bainbridge Island in Washington State. The Project holds workshops, classes and ritual gatherings for girls and women and facilitates adolescent focus groups for both genders as well as intergenerational dialogs between teens and elders. A guided journey to expanded consciousness that will give you a sense of relaxation, peace, and bring you beyond the edges of your body -out to meet the true nature of your being. The inspiration of the words along with the trance inducing music will take you where you may have always wanted to travel. IT WORKS! 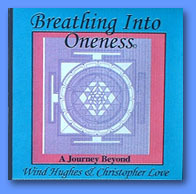 This CD explores the realities of energy, frequency, vision and living life as a sacred path. Complex mystical and quantum realities are explained in way that is simple and applicable to our daily living. Filmed at a conference in New Mexico this video captures the passion and clarity wind brings to living from the deepest esoteric truths. It provides provocative ideas for living in alignment with Natural Laws of creation. In addition to the powerful teachings this video includes a trance drumming segment and a chakra tuning session both accompanied by magical and beautiful photo and visual images.